Speak Softly And Carry A Real Big Stick! I support a Constitutional approach to foreign policy that ensures a strong national defense. Who can argue that at this moment in time, we have the most powerful, most advanced military in the history of the world. In May, 2011, we saw the impressive Navy Seals demonstrate the stealth capability of the US forces by the taking of the terrorism chief, Osama bin Laden. Nobody in the world can match the power or the technology of the US. Having great leadership to command this force is of the utmost importance. One can conclude that if we were to fight a war and if we chose to fight to win, boldly, quickly and conclusively, there would be minimal US casualties, and the notch of victory could be hailed. However, it seems that we are no longer in armed conflicts to win them but instead after decades with no declarations of war by Congress (required by the Constitution), we have been snookered into permitting them to continue unabated. Why not just win them and then they are done? In early 2011, for example, we became embroiled in Libya, with apparently no plan to win so this administration has not yet learned to handle the awesome responsibility of a mighty army. These conflicts are often begun in the name of defending our national interests, but then all of a sudden we are running guerrilla policing campaigns that cost us our precious soldier's lives, and we seem to give terrorists exactly what they want. Why can we not figure out how to avoid all American deaths as a condition to assist the countries that call upon us for help? Hand to hand combat, guerilla fighting, and house to house recommaissance are not in the best interests of preserving American lives when we go to war to help another country. You may know that we have troops in over 120 countries. Can you imagine that? Isn't that a little much? If we are helping so many countries, why do they all seem to hate us? Why do we care? If we do so well overseas in 120 countries, then why are our own borders unprotected? Does it make sense to fight terrorists abroad on their home turf, when our own front door is wide open and unlocked. How is it that we permit over a million illegal aliens to cross our borders each year without our knowledge. Is this not a clear threat to our nation's security. How many terrorists come in freely across our prous borders. As mighty as our foreign forces are in battles, the battles on our border which we choose not to fight place America in a precarious situation. A five year old, if explained how we handle the securing of our borders would tell us boldly that we stink. We adults know that would men the five year old things we are inept and incompetent in protecting our borders. The fice year old is right. And, as ana side, when we have no jobs for Americans, is it not just as stupid for us to give foreigners our jobs? The Founding Fathers warned us that concern for other countries above America sacrifices our independence and integrity as a nation. Jefferson was the most vocal. In his first inaugural address, he proclaimed that America should have "peace, commerce and honest friendship with all nations - entangling alliances with none." Today, America's interests are undermined by subtle deference to foreign entities such as the International Monetary Fund (IMF), World Bank, World Trade Organization (WTO), and the United Nations (UN). It's time to end these things that do not make sense for America. Who sold us out? "Now let's set the record straight. There's no argument over the choice between peace and war, but there's only one guaranteed way you can have peace -- and you can have it in the next second -- surrender." "You and I know and do not believe that life is so dear and peace so sweet as to be purchased at the price of chains and slavery. If nothing in life is worth dying for, when did this begin -- just in the face of this enemy? Or should Moses have told the children of Israel to live in slavery under the pharaohs? Should Christ have refused the cross? Should the patriots at Concord Bridge have thrown down their guns and refused to fire the shot heard 'round the world? The martyrs of history were not fools, and our honored dead who gave their lives to stop the advance of the Nazis didn't die in vain. Where, then, is the road to peace? Well it's a simple answer after all. "You and I have the courage to say to our enemies, 'There is a price we will not pay.' There is a point beyond which they must not advance." And this -- this is the meaning in the phrase of Barry Goldwater's "peace through strength." "Winston Churchill said, 'The destiny of man is not measured by material computations. When great forces are on the move in the world, we learn we're spirits -- not animals." And he said, "There's something going on in time and space, and beyond time and space, which, whether we like it or not, spells duty.' "
In this speech in the 1960's Reagan also said, "You and I have a rendezvous with destiny." What will be our destiny? Teddy Roosevelt was a Rough Rider and he beleived we speak softly and we carry a big stick. Today there is a lot of tough rhetoric against Iran and North Korea, and for some strange reason there is now tough rhetoric on Israel. What is wrong with this President? We support the overthrow of our friends in Egypt and Tunisia, and yet we back our enemies in Iran. What sense does that make. We had no fight with Muommar Khaddafy's Libya after he swore off nuclear weapons and began to act as an ally but yet we are plotting with people who we know espouse terrorism against the US to replace a regime that in the recent past at least has been helpful. If we have intelligence, why don't we use it? We live in a strange world. Right now we wound down a war in Iraq our firing is up quite a few notches in Afghanistan. And, Libya is so messed up, our plan changes from daya to day. Should we have foot soldiers in any of these lands for any extended period? I say no. Once I belived it was necessary but we have silly rules of engagement that prevent us from using our might and winning. If the rules of engagement we use on the battlefield were deployed against bin Laden on May 1, 2011, we might be trying to figure out how to rescue the 40 Navy Seals from Osama's compound, and they would not all be alive. Thinking some more about that last comment, the Navy Seals would have accomplished their mission because there are none better than they. However, if they were constrained from doing what was necessary to accomplish the mission with no casualties, there probably would have been casualties. My point is that we ask our soldiers in the battle field to tie their hands behind their backs and then conduct war. The enemy uses human shields regularly and they put US soldier killing weapons in regular homes and our troops are not permitted to fire on them. If these terms of engagement were used in the bin Laden capture, our troops would have been handicapped trying to remove the human shileds without harm, placing the whole mission in jepopardy, and possibly costing American lives. The Seals are that good that their hands can be tied behind their backs but why do we want to do that? I have a fried who was in Iraq for several tours. He told me that when he first came to Iraq, they were frequently fired upon by mortars from neighborhoods. The satellites or AWAC type planes would quickly give them the coordinates of the fire and within seconds the US would fire back and take out the enemy's heavy weapons. Then one day, they were told they were not permitted to fire back because every now and then a neighbor who was non-militant would be killed or wounded. For the rest of that tour and all of his next, the rules of engagement were designed by the PC crowd, and as Americans were killed, they were not permitted to return fire. When we fight a war, my point is we should fight to win and we should preserve American lives, not the lives of the enemy. 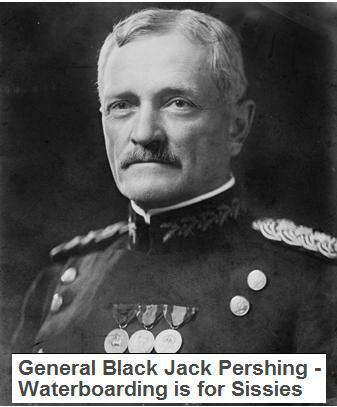 General Black Jack Pershing was born on September 13th, 1860, near Laclede, Mississippi, and died on July 15th, 1948, in Washington D.C.
Just before World War I there were a number of terrorist attacks on United States forces in the Philippines by Muslim extremists. General Pershing captured 50 terrorists and had them tied to posts for execution. He then had his men bring in two pigs and slaughter them in front of the now horrified terrorists. According to the Koran Muslims are forbidden to eat pork or touch a pig. They believe to eat pork or touch a pig, its meat, its blood, or any of its by-products is to be instantly barred from paradise and the 72 virgins and dooms them to hell. The soldiers then soaked their bullets in the pig’s blood, and proceeded to execute 49 of the terrorists by firing squad. The soldiers dug a large hole, dumped in the terrorist’s bodies, and covered them in pig blood, pig entrails, etc. Then they let the 50th man go. And for the next 42 years there was not a single Muslim extremist attack anywhere in the world. Perhaps it’s time for history to repeat itself in Iraq and Afghanistan? The question is, where do we find another Black Jack Pershing? I am not against the efforts that are underway in Iraq and Afghanistan and I do appreciate the work of our brave armed services. I think it is about time we called it quits fighting wars in the Middle East as it does not seem to work. Radical Islamic Terrorists will never like us, and they will never be at peace with us or with each other. We taught them a lesson. We got bin Laden, so let's let them fight their own wars. I am against all wars in which we offer our young as potential casualties because we choose rules of engagement that cause Americans to die. I say we either fight to win and we fight the war like it is a war and not a police action, or then as quickly as we came in, we get the hell out. Win and leave would be my strategy in ending the Afghanistan conflict. Let the Peacekeepers from the UN then come in. Let them be from other nations. Replace our troops with a ton of predator drones and be gone. If we engage anywhere, our mission should be get in, win, and then get our warriors out. I don't have access to the information that the President has available so I don't see all he sees. But, even without that, something is wrong when we can't win against puny little countries. What's wrong is we either have chosen a bad war or we have chosen not to win. I think the latter. Until George Bush decided to win the Iraq war, we were sending our boys to be slaughtered by roadside explosives or picked off by snipers in a country that wasn't sure if they even wanted us there.or not. We should back countries who are our friends like Israel and we should not trust countries with whom we do not have a long standing history of trust. We should not bear the pricetag for all these wars either. If the Saudis and others are benefitting from our involvement in the Middle East, they should be presented a bill for our services as we exit stage right. God bless our fighting men and women for keeping us safe, and God bless America!